A native of Santa Barbara, California, Nicole grew up in a classically trained household of musicians. Her father was a violinist who graduated from Juliard and her mother is a classical pianist who graduated from the University of Texas and Berkeley School of Music. “Too Marvelous For Words.” Nicole’s vocals are effortlessly fun and the band joins in with the same excitement. Jon Crosse, Paul Anka’s musical director, plays the saxophone as well as flute, clarinet and trumphet on the album. “Here’s that Rainy Day” is an enchanting interplay of flute and vocals over a bossa nova beat. Check out the ever so sassy “Fever” with a funky groove and ever so sultry vocals. “Whatever Lola Wants” and “Caravan” involve the entire ensemble, introducing Lorenzo Martinez on bongos and shakers. To be sure, these high energy songs are some of the highlights on the album. The album ends with the haunting “Don’t Explain,” where there are only vocals and piano. It is reflective and heartbreaking, ending the album with beautifully expressed emotion. “Here’s That Rainy Day” is Nicole’s first album, and definitely an eye opener to a singer with a voice that is full of honest sweetness and warmth. 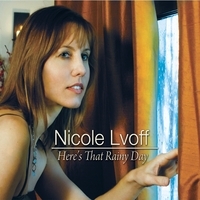 Welcome to Nicole Lvoff’s first album, “Here’s That Rainy Day.” We hope you enjoy it as much as we’ve had making it. And we look forward to hearing more from this vocal chanteuse. We have a feeling there is more to come…rain or shine! this is a fantastic recording for a new artist. maybe i won't have to wait years for the next one. Of all the cabaret I have heard lately this album stands on top.